EULEX Strengthening Division organised a two day workshop for Kosovo Police, Prosecution and Judiciary involved in processing hate crime cases. The workshop was held on the 8 and 9 of December 2016 in Pristina. EULEX Strengthening Division has organized two day specialized workshop on investigation and forensic coordination of sexual and gender based crime offences on 6 and 7 December in Pristina. From 25 November, the International Day for the Elimination of Violence against Women, to 10 December, Human Rights Day, the 16 Days of Activism against Gender-Based Violence Campaign is a time to galvanize action to end violence against women. EULEX International Law Enforcement Unit organized a two day workshop on the 26th and the 27th of October for Kosovo Police and Kosovo Customs. Today, the head of the European Unions Rule of Law Mission in Kosovo (EULEX), Ms. Alexandra Papadopoulou met the Kosovo Minister of Internal Affairs Skender Hyseni. Today, Ms. Alexandra Papadopoulou met with Kosovo President, Hashim Thaçi. 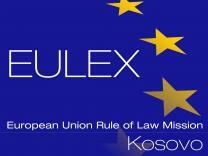 Today, Ambassador Alexandra Papadopoulou has taken up her duties as the new Head of the European Union Rule of Law Mission in Kosovo (EULEX). The detection of forged travel documents is one of the tasks of every Border Police Officer at the borders in every country. As the result of the of very successful and fruitful cooperation between Kosovo Judges and EULEX judges, the Jurisprudence Digest was officially announced during todays launching ceremony organised by EULEX. Cross border cooperation is a priority when it comes to tackling transnational organized crime. Between 3rd and 5th May  EULEX organised and funded a Drug Detection Training Course for Kosovo Border Police and Customs Officers. On Wednesday, April 13, EULEX organised a panel detailing its ongoing support to Kosovo Police (KP) in the north of Kosovo. Last Thursday, March 18, EULEX organised a Crowd and Riot Control (CRC) training for Kosovo Polices (KP) Quick Response Teams. On March 8, EULEX in partnership with UNMIKs Rule of Law Liaison Office in Mitrovica, organised a discussion on the challenges of restoring rule of law in the north of Kosovo. Gender Mainstreaming is a globally accepted strategy for promoting gender equality. EULEX Regional Advisors organized two meetings gathering local actors dealing with domestic/gender based violence in the north of Kosovo. Between February 15 - 18, EULEXs Executive Police Department held a training workshop at the Kosovo Academy for Public Safety in Vushtrri/Vucitrn. Today, the EULEX Mission hosted approximately 140 students for a lecture focused on the work of EULEX and the challenges it faces in implementing its mandate.